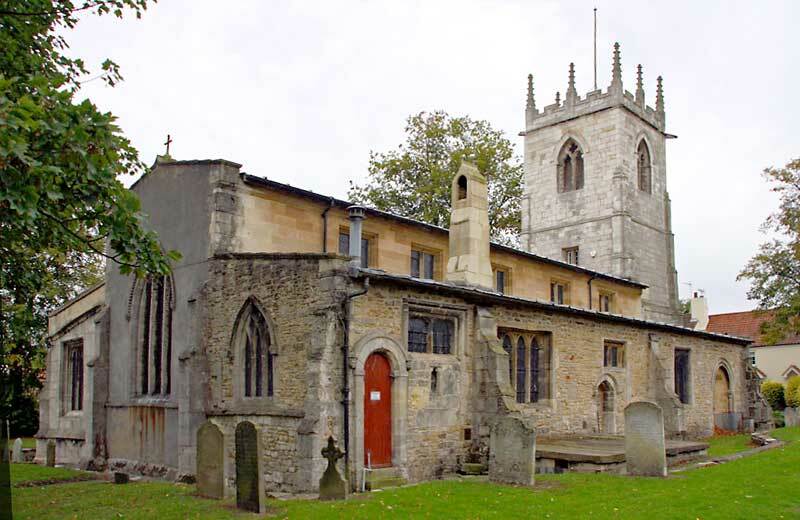 Although Bawtry is in Yorkshire it has historically formed part of the Archdeaconry of Nottingham and, more recently, the Diocese of Southwell & Nottingham. It is a Transitional church founded in 1190 with 14th and 15th century alterations. John de Buisli built the church, along with Austerfield St Helena, and gave them both to Blyth Priory. They were both separated from the parish of Blyth in 1858. The building consists of an aisled three-bay nave, two-bay chancel with south chapel, north organ chamber, vestry and embattled west tower with eight pinnacles containing bells and a clock. 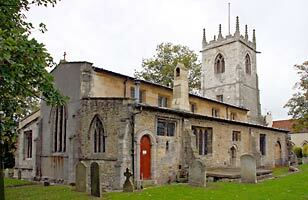 It is built primarily of ashlar magnesian limestone, with the east end stuccoed. Modern wood doors provide access through the tower and south aisle. In the north aisle is a blocked door of c1200, a similar date to the north arcade which has round piers with octagonal capitals. The south arcade is Perpendicular with octagonal piers and capitals. There is a clerestory (built in 1900-1) through nave and chancel. The church has numerous late 18th and early 19th wall monuments above the arcades. As well as a wooden chancel screen there is a good late 18th century wrought-iron screen to the south chapel. Also a painted Royal Coat of Arms, dated 1685. The east window is by Kempe c1902. The tower was largely re-built in 1712-13 but reusing some 14th century material. The ogee-headed piscina was restored in 1844. A major restoration of the church was undertaken by Charles Hodgson Fowler in 1900-1. Further restoration of the tower and bells took place in 1944.
and to Geoff Buxton and Dr Chris Brooke for the photographs.